Lens Description: The Leica APO-Macro-Summarit-S 120mm f/2.5 CS Lens is a superior-quality close-up lens with a reproduction scale of 1:2 and a high-speed telephoto. This reference-class lens, with special grades of glass and aspherical surfaces, displays consistently high image performance utilizing an inner focusing system with a floating element. 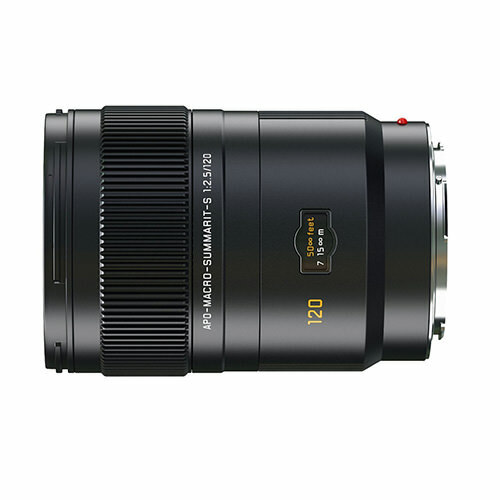 The APO Macro Summarit-S 120mm f/2.5 CS is equipped with an integrated Central (leaf) Shutter. Photographers can activate the shutter via the camera\'s main switch and it enables flash units to be used at a shutter speed of 1/500 second. The shutter also has an electronically-controlled drive guaranteeing reliable, fast exposure times and low energy consumption. This lens is suited for many applications due to its superb close-up and telephoto capabilities. It displays maximum performance even at full aperture settings. Vignetting, distortion and chromatic aberrations have been minimized to such a high degree that the need for quality-degrading image corrections and simplifying digital post-processing is substantially reduced.